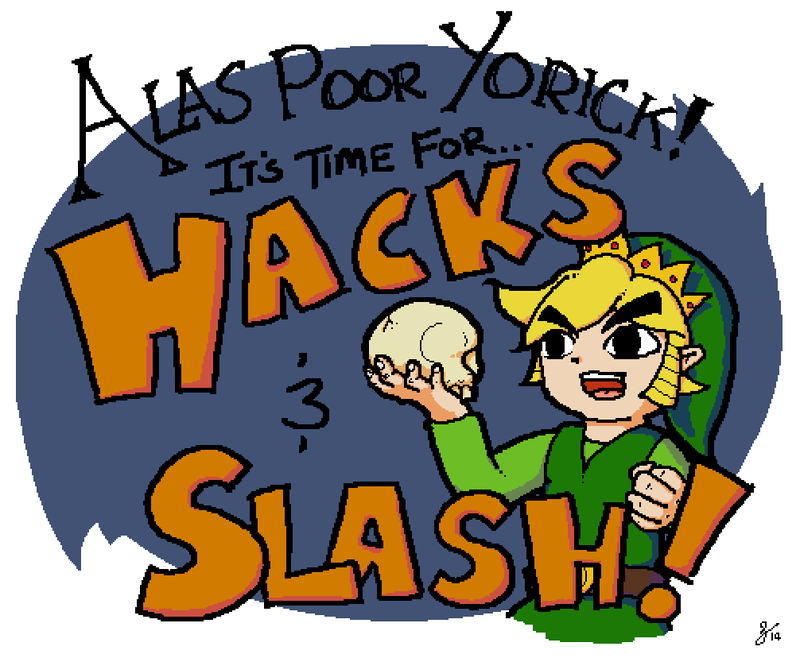 It’s “Hacks ‘n’ Slash”, the podcast where we read bad fanfiction! Today, GameCola writers Diana Gray, Michael Gray, Joseph Martin, and Jeff Nemeth read a selection of stories from ChrstnWrtr (AKA Shannon), who mostly writes Legend of Zelda crossovers. This author may be the only person in the world who has written three separate crossover stories between Zelda and William Shakespeare. “Shakespeare Visits Hyrule”. Shakespeare comes to Hyrule for no real reason, and he puts on plays that the author clearly hasn’t read. King Link thinks the plays are boring, so he gives Shakey some writing tips. Shakespeare uses them, then leaves. “Link Is Transported to Shakespeare’s World”. This story is completely unrelated to the previous one. Link is magically transported to England. Shakespeare renames him “Reginald Crates” and forces him to be in a play. After an improv fight sequence, Link quits and goes back home to his wife and kids. “Link Meets Hamlet”. After his soliloquy, Hamlet arrives in Hyrule. He sneaks into the castle and is arrested by King Link. Link speaks with Hamlet in jail and gives him Biggoron’s sword so Hammy can kill Laertes. “Blue and Steve meet Link!”. In a special episode of Blue’s Clues, Steve and Blue travel to Hyrule and visit the grocery store. Inside, they meet Link, and Link decides to be incredibly sassy. Ironically, this is the only story out of the four to not be written in blue-colored text. These stories ain’t Shakespeare, but we hope they entertain you anyway. So, when are we reading the rest of these crossover fics? Sounds like we just found a volunteer to host the next episode! Hooray! Have I mentioned yet that if I’m put in charge of anything that something will inadvertently catch on fire? Because that’s what would happen if I hosted the next episode. Wow I can’t believe you guys got Warrick Davis to reprise his role as the Leprechaun for the part of William Shakespeare.